Charge sheath vortex basics . 1 ) Two stationary particles carrying the same electrical charge will repel each other, but within an electric field they will form dipoles that will experience an attractive force. 4) An electron cascade of electrons briefly following a free path throughthe magnetic field will briefly travel at very much higher velocities andcontribute to a greatly intensified electromagnetic field. By a quirk of history, diagrams of electrical current show the arrow for current direction for the movement of positive charge. This makesno difference for the charge sheath, but can be a little confusing forstudents of electricity at first. The arrow on field lines is shown pointing to the south magneticpole. The direction shown by a compass. We know from Z pinch experiments that the electromagnetic forcesthat draw the particles togther is greater than the electrostatic chargethat pushes them apart. 4) This can develop into an electron cascade where fast moving free electronsbriefly follow the circular path round the vortex and greatly increase themagnetic field strength of the vortex. Consider the case where a fast moving stream of positive particlesforms a loop in the absence of an externally applied magnetic field.There is a powerful force of attraction between the particles moving inparallel as in B above. Note that the charge particles have to be very fast moving in order to sustainthis vortex. At lower speeds the charge repulsion will be greater than theelectromagnetic attraction, unless the vortex forms in a small region ofa larger uniform charge cloud. The faster region with the greater magnetic field will be pinched more, speeding up the flow, which increases the pinch and so onbecoming longer and thinner. But the extension in length cannot be accommodated in a straight line. It can only force the stream to form a loop. 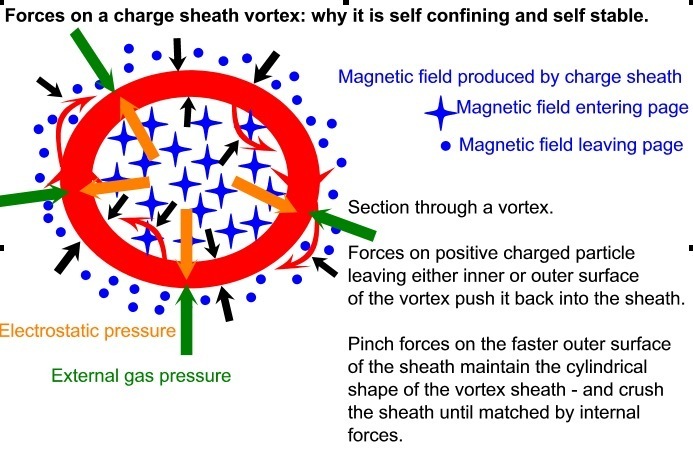 The forces between the charge particles within the charge sheath are balanced by the charge field in the surrounding region in a large cloud, so the forceof repulsion between the charges is zero -only the electromagneticfield remains. If an electron cascade takes place then the vortex will bestable even in a small region of plasma. Within a non neutral plasma, if the plasma is travelling in a straight line, the inwards forces on both sides of the plasma are equal, but ifa kink starts to form, the plasma on the outer surface is travelling fasterthan the plasma on the inner surface. The inward force on the outer surfaceis therefore greater than the outward force on the inner surface. The plasma sheath is compressed between the powerful inward and outward forces, accelerating and generating yet more powerful forces. 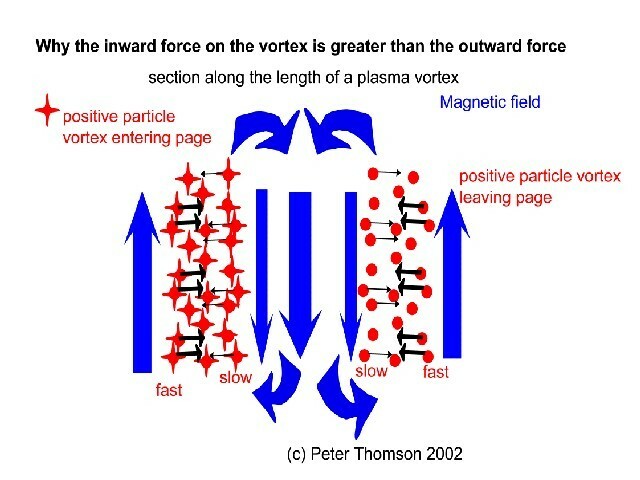 Since the outer force pushing inwards always remains the stronger, the vortex will compress and narrow- until the forces generated by the opposing sheathwall spinning in the opposite direction prevent further compression. The force needed to turn the particles into the curve willalso increase as the velocity increases and radius of curvature increasesand will put a limit on the minimum radius the vortex can achieve. 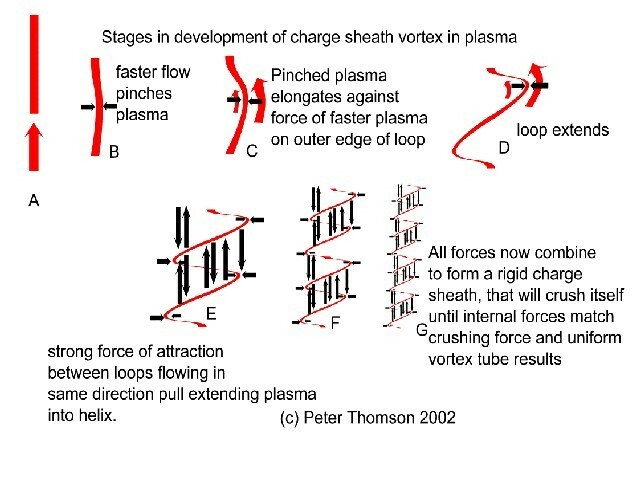 If there is a significant population of free electronswithin the rotating plasma, then these will move in the direction of rotationat much greater velocities than the bulk flow of the plasma, and contribute a very large component to the solenoidal or torroidal electromagnetic fields.This will make the charge sheath vortex stable even in a small volume ofcharged plasma.